Writing this the 29th, based on memory and photos. We had potato salad to use up, and D suggested we defrost one of Christopher Lee’s Calabrian sausages to have with it. He had bought some broccolini at the Grand Lake farmers’ market I think (right day) and boiled that up and served with butter and salt. The sausage he cooked in a bit of oil for many minutes, then split lengthwise to be sure it was cooked internally, and laid it cut-side-down on the frying pan to finish it. 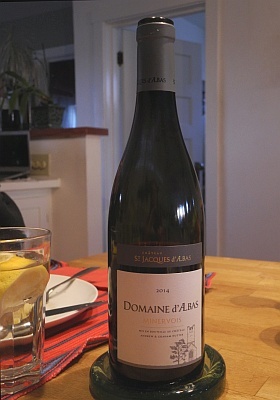 We had what is sort of our new house wine with this, Domain d’Albas Minervois (2014) from The Wine Mine. 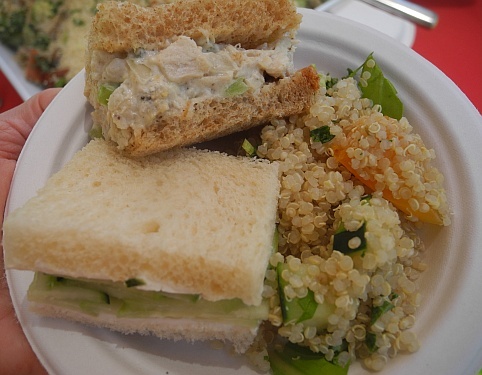 Had a nice small lunch, after the students graduated, at the President’s reception, where there were a selection of small sandwiches and salads. The chicken salad was the winner. The other one here is cucumber, with I think cream cheese or chevre (sorry don’t remember). 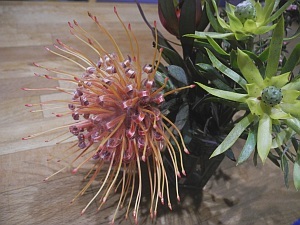 There was a salmon one (not pictured) and another. The salad is quinoa ‘n’ stuff. 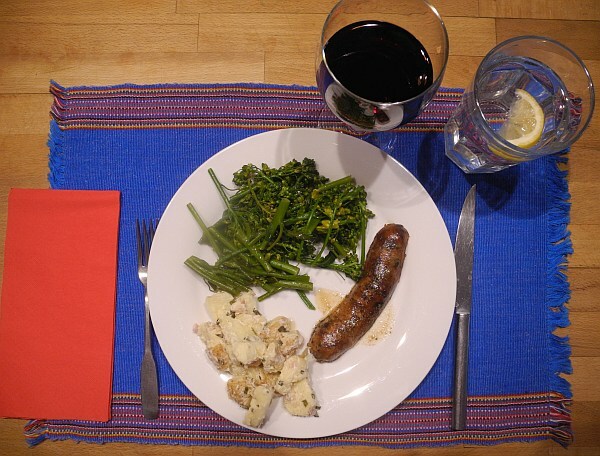 This entry was posted in Lunch, Sausage and tagged Broccolini, Calabrian sausage, Christopher Lee, Minervois, Potato salad, Potatoes, Sausage, Tarragon. Bookmark the permalink.